To raise much needed funds for the Church at Heatherycleugh we are having a Car Treasure Hunt. Entry forms will be available from September 11th and the closing date is October 2nd when it will be drawn at the Harvest Festival and Teas afternoon. 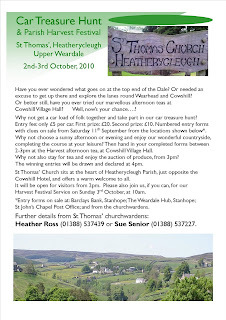 All clues are in the Parish, so come along and see the wonderful views of the Dale and have fun with the quiz. (£5 per car). Click onto the image to enlarge it. If you are able to print one & display it for the Church we would appreciate it! !